A day at the beach with family is the perfect outing. What’s better that bathing in the sun and splashing about in the Gulf with your family? This is a relaxing endeavor that the whole family can enjoy–building sand castles, flying kites, swimming, and much more! It is also a great way to spend the day bonding with the family on our beautiful Mississippi beaches. A good family trip to the beach can be enjoyed by anyone and can give you and your family lasting memories. There is plenty of open space on the beaches of the Gulf Coast so you can rest easy while your children play. Just always watch them near the water. Although many areas can be shallow for small children, there are abrupt drop-offs. If you are concerned, put a life jacket on children who are not great swimmers. 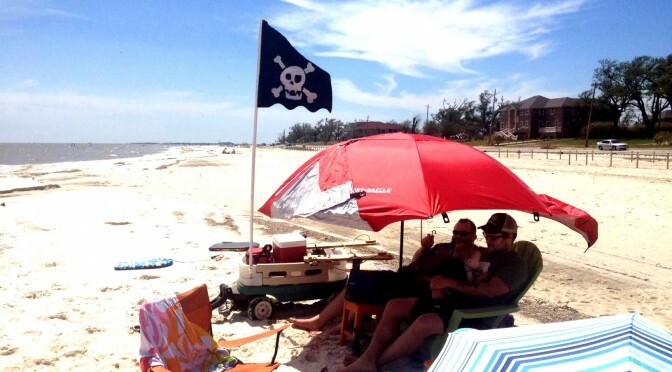 The pirate ship wagon has landed on the Waveland beach. Having a picnic on one of the many beaches along the Gulf Coast of Mississippi is an inexpensive lunch idea. Anything from sandwiches to a meal prepared earlier can be enjoyed on the warm sand of the Gulf Coast beaches. Be sure to bring a bag for trash so you can keep our beaches beautiful. This is a great opportunity to unwind for all ages. Listening to the tide crash against the shore with a full tummy can bring anyone to a utopia of relaxation. Clean family friendly beaches along from Biloxi and Ocean Springs to Bay St. Louis and Pass Christian. The beaches along the Coast of Mississippi have plenty of great activities to offer. You can rent equipment to play on, and volleyball nets are always available. Bringing your own entertainment is always a solid option as well. Building sand castles can be a fun, recreational way to sculpt a beautiful work of art with sand and is inexpensive! To sum it all up, the beaches along the Mississippi Gulf Coast are a fantastic place to spend the afternoon, to watch the sun set, to have a fun family outing, or even just to go and relax. It is always a safe, fun experience for the whole family. Did I mention how beautiful the night sky is on the beach?